What a great post! I’ve never eaten canoli, but I did have some very similar encounters with northern Italian men when I was on holiday with a friend. The oddest chat-up line I came across was in Rome, when one man got his wallet out and started waving it around saying "I have current account, I have current account". Good luck with work, I’ll miss you in the office! Great post, Melissa! I’ve been to two extremes of Italy as well – Alto Adige up north and Calabria down south. Very different experiences (and I definitely realised that sometimes it’s a handicap to be naturally blond-haired and fair-skinned:)Also – I managed to bump into a same guy two days in a row in totally different parts of Athens – a city of 5 millions! – few years ago. The problem was that I rejected his invite for a drink on a previous night by saying that I have to go to sleep and catch a ferry to the islands early next morning. Imagine my embarrasment when we met again next evening.. Good luck with finishing your PhD – you can do it!! Melissa, I loved this story. It reminded me of my summer in Florence a few years ago, where it was virtually impossible to sit uninterrupted in a cafe with my journal and my cafe freddo…Your cannoli look absolutely divine, and make me wish I could bite into that crunchy, crumbly creaminess right now. Good luck with the PhD, and know that you’ll be much missed! Good luck Melissa ! I’m getting my Ph.D too and I sympathize. I’ll miss your posts !I hope you’ll be back soon ! As always, wonderful story-telling … I had the "northern" experience in Greece … a tall blonde getting off a plane with Finns seeking mid-winter sun … enter Terry the Greek God as I called him then and still now … the blonde melted … but for a week I had dinner with his family twice (they were used to blonde girls speaking hand sign and English …) and danced all night at a wedding … and shared long meals in tiny little tavernas in back alleyways … so … who knows … there might have been an upside? Still, always listen to your mother and your instincts. I know mine was horrified1! Melissa,Wonderful, evocative storytelling…I am reminded of my own trips to Italy and how much I loved the place. Forunately(?) I was not traveling alone so I did not get the "friendly" experience you did!Best of luck with your Ph.D! Mmmm. Delicious. In every way. Good luck with the dissertation. That real life stuff is the pits. See you in May. I’ll miss your weekly postings so much while you’re off doing "real" work… 😉 Good luck and come back very soon! Well for your semi-farwell post, you couldn’t have done better! And even thought I constantly think it, I don’t think that I have ever mentioned that….you make THE most beautiful pictures. Good luck on your project! Connecticut Italians are, by and large, Sicilians, with immigrants from specific cities resettling in specific Connecticut towns — those from Amalfi went to New Haven, from Melilli to Middletown, etc. We headed home for Easter and celebrated with a trip to my favorite Italian pastry shop. We came away with some lovely cannoli, but it’s hard to justify the 6 hour trip just for the pastry and the pizza. So it’s nice to now see how I can make my own between trips. Thanks! And good luck with your Ph.D.! The best success on your Ph.D! 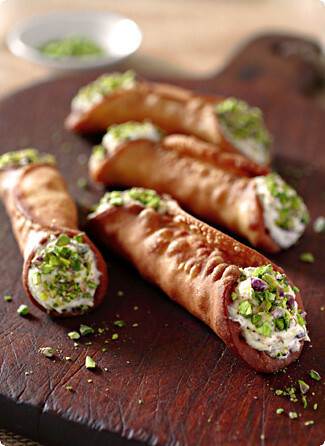 Perhaps I can find time to make these beautiful cannoli before you are back blogging! Your post brought back many memories of Italy for me. I’ll never forget my first visit to Rome with my wife. While doing laundry, the man running the laundromat offered my wife a massage.Your cannoli look wonderful, especially the vibrant green of the pistachios.I’m sad to hear you’re on a brief hiatus, but I wish you all the best in your studies. Ah, the Italian men…These cannoli look gorgeous (of course). Strangely, I was watching The Godfather on dvd — as a way of postponing my academic work — and read your post just after. Sicily has a different connotation for me right now! Please take care of yourself in your absence. You’ll feel so much better when all that nasty work is done. And then you can come back to us renewed! Good luck (and much sympathy) with your PhD. No matter how it looks, you will eventuallly finish.If your work is even half as good as the writing on this blog, you’ll do fantastically. Ciao, bella! I’m going to miss your lovely stories, beautiful photos, and tempting recipes while you’re gone. Best of luck on the PhD! What a beautifully written story, Melissa. How I want to visit Italy, and how I want one of these cannoli!Good luck with your PhD! Melissa,Reading your posts is like travelling down memory lane with you. Your account of the "attention" Italian men like to pay to young women was particularly enjoyable.And the photo of the cannoli is too much … the vibrancy of the pistachios is almost breathtaking.Lovely post.All the best with your PhD work! Love the post! Great armchair (desk chair?) traveling. Good luck with your month "off." Hah hah hah… fantastic post. Having done the backpacker thing across Europe several times when I was younger, and then having lived there for a brief time, I remembered being constantly amused how European men flocked to and hit on any American female traveler. Of course, the misunderstanding was that all American girls were "easy". I’ve watched friends fight off swarmy Italians and skanky Frenchmen. One rather overzealous Greek even tried to climb into the sleeping bog of one female friend during the ferry trip from Athens to Ios — with her still in the bag. Amazingly, the minute the same gals started sewing maple leafs to their backpacks, the men started to leave them alone. Go figure. Good luck with your writing. S has till June to finish hers. If she doesn’t, she won’t get the degree. So, we’ll be thinking of you as she also finishes hers. I just came across this blog not too long ago, and now that you’re taking a break I guess I’ll be occupying myself by reading back all your old entries 🙂 You’re a splendid writer; godspeed with the dissertation writing. Ooh – the memories of my Nonna’s kitchen! I grew up on cannoli like this (and grew out, but that’s why God made Weight Watchers). Best of luck on the PhD! Oh, Melissa, best of luck on the dissertation! I hope it all goes well and smoothly. We will miss you until you come back. Oh cannoli! So delicious. Good luck with your work! Great story! I’ll look forward to your next post… Good luck with your PhD work! Hah! Wonderful story! Have you read Sarah Vowell’s account of her own experiences with cannoli in southern Italy? I think you’d get a kick oout of it! I just recently discovered your blog and was delighted by what I found: beautiful photos, excellent writing, and recipes that are inspiring. I imagine how hard you must be working now on your PhD. Best of luck with everything, and thank you for your blog. Great story, and even better recipe. Tried it for a "Sopranos night" theme dinner and they were a big hit. Good luck with your PhD!! What a brilliant post. I experienced the same ‘stalking’ in Italy, and it really woke me up to my instinct, for example some men became very creepy and my gut feeling told me to move, blend in with the crowd, ignore, etc. It does become awkward, especially as I’m a very polite person and could never imagine telling someone to blatantly go away as I’ve been recommended.I’m going to Sicily for the first time in two weeks, and can’t wait! this is hilarious,i was just searching for something and came across this on google. I’m from nearby Taormina. I know what u mean, all my friends are like that. In Sicily in the tourist resort towns its normal to chase the foreign tourist girls. It’s sort of a tradition almost,hehe.I’m surprised though that your little ecnounter with this ‘short guy’ was described so traumatically. In Italy you’ll maybe get the ciao bella and some attention which i appreciate may be annoying but it compares in now way say to what girls get on a night out in the UK for example. I’m a little upset that you give us a fearful reputation, and descrive events in such dramatic tones.Most of the time its just harmless, some nowadays have no style but hey imagine if u were a young guy growing up in Taormina and u see all these attractive foreign girls passing by as u walk from school. When you’re older u’ll be curious. Courtney – I’m probably not the best person to ask for specific advice about Sicily, considering how long ago I was there! I would say try to see as many places as possible, as they each have their own unique flavor: Taormina (of course), Palermo, Siracusa, Agrigento, Cefalu, Noto… The Aeolian islands are really spectacular, too, if you can fit them in. And don’t forget to have some gelato in brioche for breakfast!